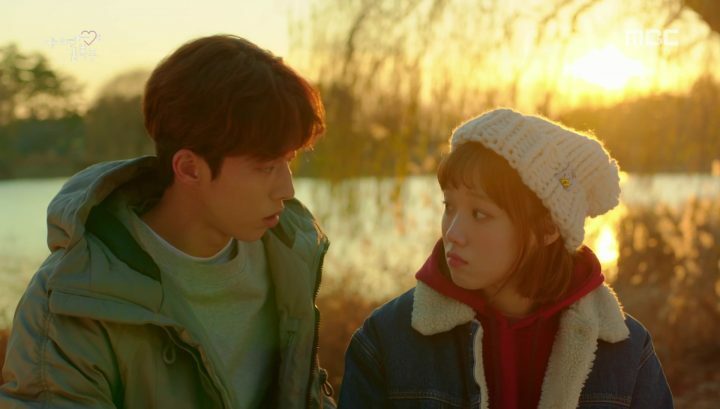 The premise of Weightlifting Fairy Kim Bok Joo is both realistic and unique at the same time. It’s a coming-of-age story about a pair of childhood friends who reconnect in college and help each other pursue their athletic dreams. In the process they encounter love, find friendship, and experience personal growth at every step of the way. What’s special about this teen story as opposed to others is that we rarely see Korean dramas focus on athletic women, much less the unfeminine and less mainstream sport of weightlifting. So the drama immediately brings a refreshing perspective to look forward to. Though the cast didn’t initially catch my attention, I soon find myself invested in their acting performances and characters, full of unexplainable charms and exciting chemistry. The drama contains very little plot substance. However, as such slice of life dramas tend to be, Weightlifting Fairy Kim Bok Joo contains very little plot substance. 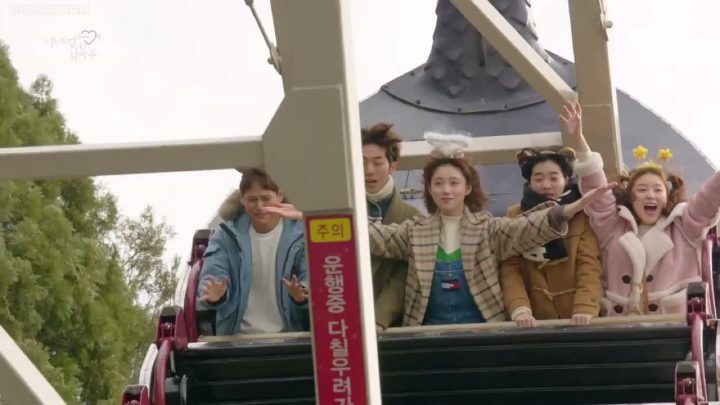 With mundane conflicts and predictable events, this drama can be on the boring side particularly for thrill seekers. Weightlifting Fairy Kim Bok Joo introduces us to our sporty leads who are childhood friends that reunite in college. 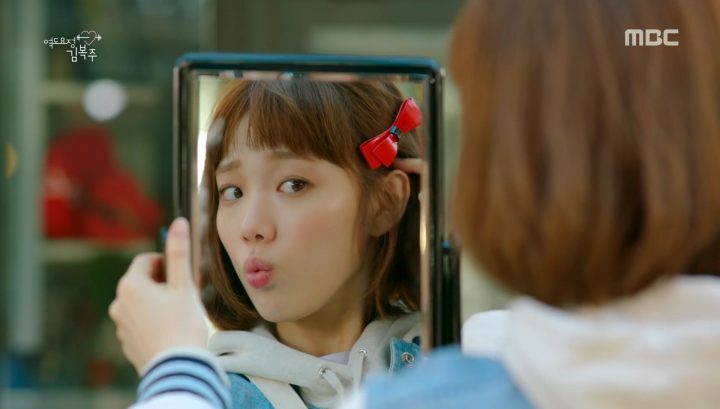 Kim Bok Joo (Lee Sung Kyung) is an ambitious and righteous weightlifter on her school’s team, but adorably awkward and insecure around boys. Jung Joon Hyung (Nam Joo Hyuk) is a talented swimmer with a frisky and impish personality. Both are outgoing, lively people. They run into each other a lot on campus, but don’t always get along. So we can already tell that this drama is going to have a fun undertone filled with playful banters. Right away, we’re introduced to Bok Joo’s dilemma. She has a crush on Joon Hyung’s cousin, Jung Jae Yi (Lee Jae Yoon), a gentle and warm-hearted former athlete who runs a weight loss center. Her crush on him leads her to try to lose weight, despite the fact that her coaches are trying to get her to move up a weight class. To me, this seems like a childish and somewhat forced motivation, so I couldn’t get invested in her crush right off the bat. Of course Bok Joo hides the fact that she’s a weightlifter, only to be caught in the act by Joon Hyung. 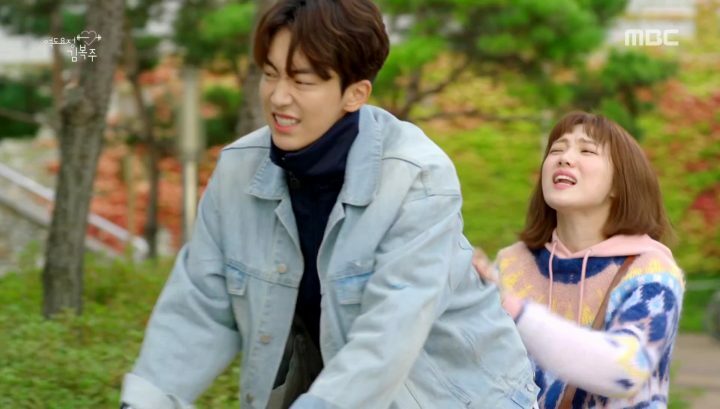 Being a total jokester, Joon Hyung teases Bok Joo and the two of them have a lot of childish antics that seem very natural, making the drama carefree and bubbly. Their childish antics seem very natural, making the drama carefree and bubbly. Meanwhile, Joon Hyung’s ex-girlfriend Song Shi Ho (Kyung Soo Jin), an accomplished and overachieving rhythmic gymnast, is back in the picture and ready to win him back. Unfortunately, she’s quite the cliche in terms of characterization — just another second female lead who antagonizes the heroine for a guy’s attention and uninspiring to follow for the viewer. So far, we’ve got lighthearted interactions and a ton of youthful energy injected into the otherwise commonplace characterization and plot line. Not a bad starting point, but I vie for more substance. 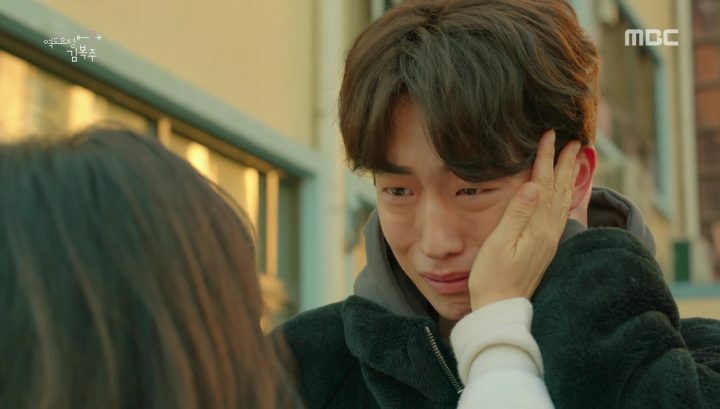 The conflicts that Bok Joo goes through in these episodes of Weightlifting Fairy Kim Bok Joo don’t have me hooked as a viewer, as I find them quite banal. The stakes in the drama aren’t raised enough for there to be a substantial engagement in the story. Lee Sung Kyung channels her character in the most believable fashion. One of the primary catalyst for the plot rolling forward is Shi Ho finding out about Bok Joo trying to lose weight, and tattletales to her coaches. This leads to a series of debates about what Bok Joo truly wants to accomplish in her life, and she consequently gives up her one-sided crush on Jae Yi. 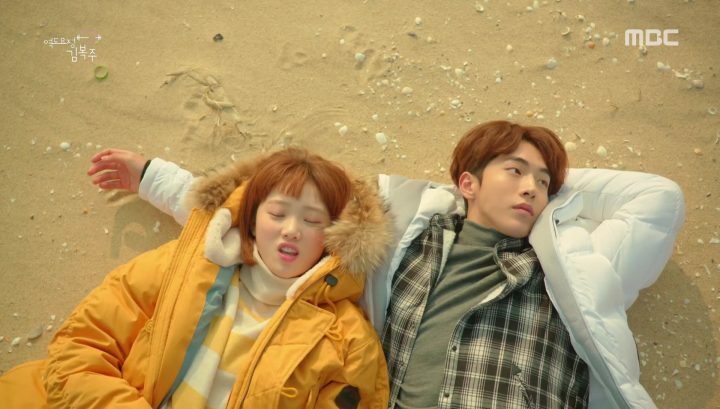 Bok Joo takes some time off school to really find herself once again. One highlight worth noting in these episodes is Lee Sung Kyung’s convincing acting performances. It really feels like she is indeed Bok Joo and channels her character in the most believable and relatable fashion. At the same time, we also find out about Joon Hyung’s past. His mom sent him to live with his aunt and uncle, Jae Yi’s parents, at a young age, effectively abandoning him. I think that this kind of a backstory feels a little too melodramatic for the light tone of the narrative that the show has presented thus far. His backstory doesn’t seem to fit well with the character’s current persona or the uplifting theme of the drama, taking me out of the story. As Weightlifting Fairy Kim Bok Joo progresses, I find myself continue to wondering what exactly the primary conflict in this drama is. Sure, it’s supposed to be about our youth achieving their dreams, but the development of events thus far haven’t put them through enough challenges for personal growth to come to fruition. 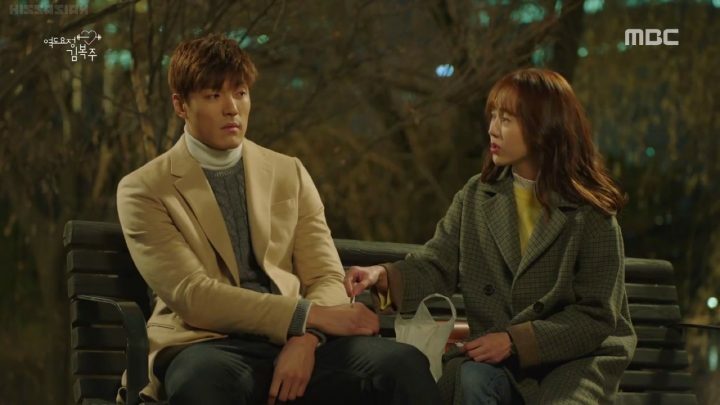 On the love line front, it’s becoming clear that Joon Hyung admires Bok Joo, and his feelings aren’t reciprocated just yet. But again, there’s not enough tension for the viewer to be emotionally invested yet. Shi Hoo is going through her own series of issues, as she struggles to cope with her gymnastics career and personal life. Things aren’t going the way she wants — Joon Hyung doesn’t like her anymore, and she’s getting sick. Yet it’s hard to find sympathy for her given how the drama set up her character thus far. Meanwhile, it also seems as if Jae Yi has been completely put on the back burner. He and his long time friend are going through some romantic issues, but they only get so many scenes dedicated to them in these hour long episodes, that it really feels like an afterthought. Although I feel that the drama’s writing could use some work, I am enjoying the ensemble of colorful characters, supporting ones included, and their dynamic interactions. For example, the side stories of the coaches and their friends are straightforward, cute, and effective. The relationships feel genuine and tangible. It’s clear now that our talented actors are carrying this show, and not the mediocre writing. These last episodes of Weightlifting Fairy Kim Bok Joo give us a couple final problems our characters must face. As expected, they push through and the drama has a clean wrap up where we see everyone move on with their lives. Bok Joo and Joon Hyung finally start dating each other. As a friend turned lover, Joon Hyung is kind, understanding, and never forceful in their relationship. The pair seem like a natural couple who’s been together for a long time. Joon Hyung’s mother comes back, which causes some emotional turmoil. But once again, this part feels a bit heavy-handed for an otherwise optimistic drama. While Weightlifting Fairy Kim Bok Joo is not without faults, there are some elements that I liked about it. The pacing, acting, and relatability of the drama are spot on. It really feels like watching college students getting together for fun, along with daily life problems they must facing as students and young adults. However, the lack of major conflict and significant plot twists in the drama is its ultimate undoing, and a big one at that. please repeat this korean drama.i like this so much and its good for the teenagers like me.this is my inspiration to my education and in my life. this is the only korean drama that made me laugh and cry so hard! aw one of the best kdrama :( i loved it. I don’t care what anyone else says… Thank you for this review! I felt like I was the ONLY one who thought this drama was lacking in plot value. It was cute, and yeah relatable but not interesting. I SWEAR I WILL NEVER TRUST YOUR REVIEWS OF A DRAMA (I’m really disappointed this time). After reading your review, I thought it would be a “Meh” drama, but since a lot of people were talking about it, I decided to watch it and I was so surprised to see how amazing the drama is, and I enjoyed it much more than I enjoyed Goblin or Legend of the Blue Sea. And it certainly is one of the most meaningful, but at the same time, fun and light dramas that anyone would love to watch. I SUGGEST YOU WATCH IT AGAIN.